Acne vulgaris, or acne, occurs in 40 to 50 million individuals in the U.S. and is the most common skin condition, according to the American Academy of Dermatology. Acne occurs from excess oil buildup, clogged pores, inflammation and bacteria. Over-the-counter products are available to treat acne breakouts, but they can be pricey. Lemon juice is a home remedy for acne treatment and is inexpensive compared to the acne products at stores. Lemons contain a natural astringent and antibacterial agent that acts as an exfoliant to help remove dead skin cells faster and prevent clogged pores. Lemon juice is not a substitute for medical treatment; consult with your health care provider to discuss any potential risks or if your condition worsens. Cleanse your skin with mild soap and water. Apply a small amount of soap to a washcloth and gently scrub your skin to remove any oil or dirt buildup, rinse with warm water and dry with a clean towel. According to the American Academy of Dermatology, dermatologists suggest washing your face once or twice daily with warm water and a mild cleanser. 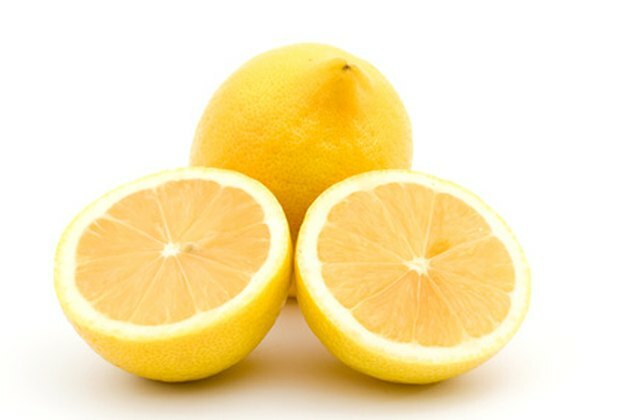 Cut a fresh lemon in half and squeeze the juice into a bowl. After use, you can cover the bowl with a lid or plastic wrap and save for another treatment. Dip a cotton ball into the lemon juice and squeeze out the excess liquid. Apply the lemon juice directly to the affected area of skin. Repeat dipping the cotton ball in lemon juice and applying it to your skin until you cover all affected areas. Wait 10 minutes. Allow the lemon juice to dry on your skin. However, if the lemon juice is causing severe stinging or discomfort, then remove it immediately by rinsing it off with cool water. Rinse the skin area with cool water to remove the lemon juice residue, and then dry with a towel. Repeat the lemon juice wash twice daily to help reduce or eliminate acne. Cleanse your skin with a mild soap and water while gently scrubbing with a washcloth. Rinse and dry your skin with a clean towel. Combine equal parts of lemon juice and rose water in a bowl. Rose water has natural antibacterial properties, is a skin toner and helps to reduce the acidic nature of lemon juice. Dip a cotton ball into the mixture and squeeze to remove any excess liquid. Apply the product directly to your affected skin areas. Let the product stay on your skin for 15 to 30 minutes and rinse with cool water. Dry your skin with a towel. Repeat the lemon juice and rose water treatment twice daily, or as needed. Perform a small skin test before applying lemon juice remedies to large areas of your skin. If you are using straight lemon juice, you many experience a mild stinging sensation upon application; however, if the stinging is uncomfortable or causes redness or inflammation, you can dilute the lemon juice with water using a one-to-one mixture. Avoid using lemon juice around your eyes. In addition, lemon juice is an exfoliant and removes the dead skin cells that promote new skin growth--this fresh skin may be sensitive to the sunlight, so avoiding sun exposure or wearing sunscreen is advised.